Disney provides them here for you. They list them out 18 months in advance so no worries on whether or not they'll have your EMH's listed for your trip. We usually let the EMH's (Extra Magic Hours) determine what parks we're going to on what day. Sometimes we change it up depending on our dining reservations and extra special activities we have planned. Be flexible and know that you're going to have a couple drafts of your grid before it's all said and done. Dining reservations open and close at the drop of a hat. There are hundreds (maybe even thousands) of people booking at the same time that you are so if you're not sure if you can work a reservation into your grid, go ahead and book it. You can always move things around later. Disney's dining reservation platform can be found here. A note about club level: We've stayed club level a couple times- no on our dime because there isn't that much of a benefit. The club level staff are lovely and do everything they can to accommodate you but they have the exact same access to dining reservations that you do so they can't pull strings to get you into California Grill for fireworks 2 months out. We recommend keeping a list of your top disney dining reservations handy to help as you're wheeling and dealing in your grid. Check out THE HOT LIST: DISNEY DINING for our fave spots. We noted on the hot list which reservations are the hardest to come by so definitely try to nab those first and be flexible. Be Our Guest is worth it. 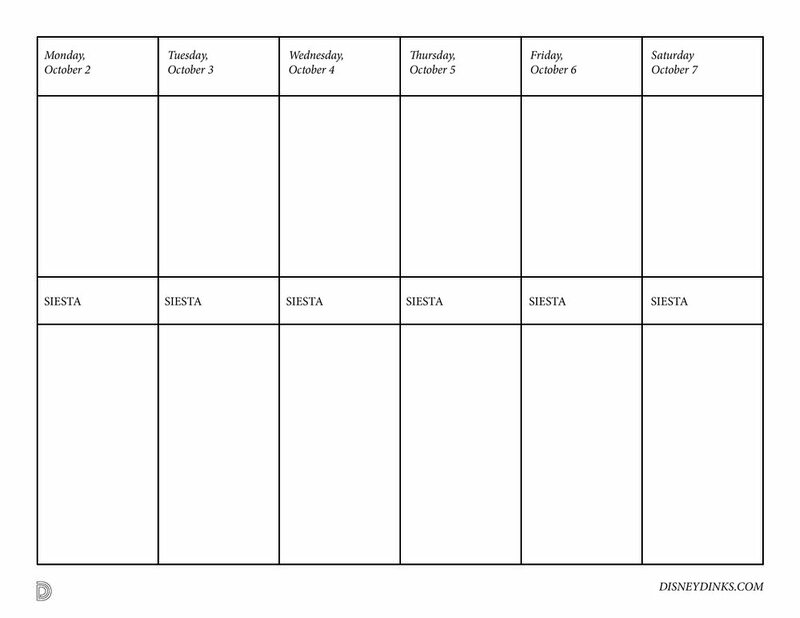 This will come in handy when it's time to create your daily itineraries on touringplans.com. Of course, these can change at any moment but it's good to have an idea of where you're going to eat even at non-reservation destinations in the parks. There are definitely some duds out there and there is nothing worse than a hangry park partner and the only thing you can find is a turkey leg because you were flippant and thought you would just wing it for lunch each day. We included non-reservation dining on THE HOT LIST: DISNEY DINING as well for you. PART SEVEN: Fill in some extra fun. Use The Unofficial Guide to help you find extras to plug into your grid. Love mini golf? Spas? Clubbing? Shopping? Go ahead and get it booked an into your grid now. Our favorite extra Disney indulgence is the IllumiNations Cruise. For about $350 your private captain takes you on a little pontoon boat cruise that ends at Epcot's IllumiNations: Reflections of Earth fireworks show. You get the best view, enjoy comfortable seats and don't have to deal with the mass exodus at the end of the night. Is it worth the expense? Probably not, but it makes for a fantastic evening that we now do every trip to Disney. These can book up fast and it's best to call (GASP) to make your reservation at 407-939-7529. They accept reservations up to 180 days in advance. YOU'RE DONE WITH YOUR GRID! Hard part is over. Have you built a grid you're particularly proud of? Post it on Instagram and tag us at @d1sneydinks or #disneydinks so we can check it out! We know it sounds tedious to know exactly where you're going to be on which day of a vacation, but trust us, it's worth it. Spending time on your touring plans helps you and your travel buddy to decide up-front what rides and attractions are top priority so you don't have that dreaded couple-fight while you're at the parks. If only IKEA had a similar app, it could save relationships! And to be honest, our touring plans go out the window after the first couple hours at the parks but they give us a list to work from. While we're in the parks we're also checking our Wait Times for Disney World app, which is surprisingly accurate, to see where we need to make adjustments to our daily plan. If you're staying on-property and we know you are because you have followed our CREDO, you can book these 60 days in advance. We recommend that you don't wait a single day to get those fast passes booked. Seven Dwarf's Mine Train, both Pandora attractions, Soarin' and Toy Story's Midway Mania all get nabbed super-fast and it's because they're all awesome so don't miss out on a fast pass and risk having to wait in line like a rube. Book your Fast Passes here. A note about Fast Passes: We know it's a hassle to have to book your rides in advance. It's annoying that the parks are so busy that you can't just show up and ride what you want to ride. It's a drag. But this is part of understanding that Disney Parks are Disney parks. You have to accept them as they are and find ways to hack them. Fast passes is part of the Holy Trinity of crushing every day at Disney and always will be- until they develop a new system. Need a reminder of what the other two parts of the Holy Trinity are? Here's a refresher for you.